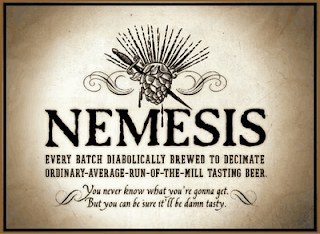 Part of Avery Brewing's Demons of Ales trilogy, the brewery says The Beast can be cellared for up to 10 years. Drinking this four year old bottle from the retail shelves of The Party Source in Syracuse, N.Y., proves the point. 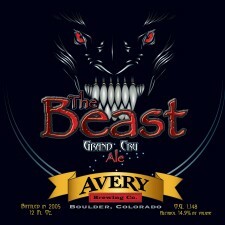 Avery The Beast is a strong Blegian-style dark ale. Avery The Beast 2006 vintage pours a lovely reddish brown hue and a firm tan head. Plenty of sweet, fruity malt in the nose. The flavor comes out strong with molasses, figs and even a slight tropical edge in the finish. This is a big 14.9 percewnt alcohol by volume brew. A 12-ounce bottle is perfect for sharing. Tickets for the Denver Rare Beer Tasting II presented by All About Beer Magazine, scheduled for Sept. 17 from 1-4 p.m. at the Wynkoop Brewery, will go on sale on Tuesday at Noon (ET). The event, which raises funds for the Pints for Prostates campaign, will feature rare, exotic and hard to find beers and appearances by the people who brew them. The event takes place on the traditionally quiet Friday afternoon of the Brewers Association Great American Beer Festival in Denver. Tickets for the Denver Rare Beer Tasting II are $80 and only 500 will be sold. The inaugural event sold out six weeks in advance. Organizers are currently working on the brewery and beer list for the 2010 event. You can check out last year's beer list here. Tickets for the event can be purchased at the Pints for Prostates website. Wild Horse Winery creates wines from 16 appellations and more than 40 vineyards from California's Central Coast. Winemakers Clay Brock and Chrissy Wittmann joined Wild Horse in recent years after serving at several other California wineries. Wild Horse 2006 Merlot is from Paso Robles, Calif. It pours a bright garnet and has black cherry aromas. Nice dark fruit flavors, with blumb, cherry and cassis showing through. Nice wood base and just the right level of tannins to the overall wine. Ithaca Brewing operates a tasting room that is open seven days a week. The company sells beer throughout New York, Pennsylvania, Connecticut, Massachusetts, New Jersey, Rhode Island and Ohio. Ithaca Apricot Wheat is the number one selling beer from the Finger Lakes brewery. 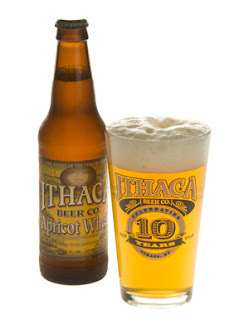 Ithaca Apricot Wheat has a fresh apricot aroma and pours a nice golden color with a frothy white head. Nice classic wheat notes, cut with plenty of fruit. But the fruit is not overpowering At 4.9 percent alcohol by volume the beer is a perfect summer session brew and a great alternative for any stuck on the light beer treadmill. Lake Placid Pub & Brewery started making beer in 1996 in the small town famous for hosting the 1932 and 1980 Olympic Winter Games. 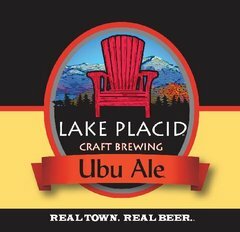 The little brewpub still makes beer for consumption on site, but the packaged product is now made in Utica by Matt Brewing Co.
Lake Placid Ubu Ale is the brewery's flagship offering. The 7 percent alcohol by volume English Strong Ale is named for a chocolate lab and has a inviting brownish red color. Plenty of great malty flavor from Two Row, Crystal and Chocolate malts. A very fulfilling brew. Chateau Lafayette Reneau has one of the most picturesque locations in the entire Finger Lakes, over looking Seneca Lake. The winery started in the 1980s and has grown over the years in stature, winning a number of awards along the way. Chateau Lafayette Reneau Niagara Mist pours a lovely golden color and immediately offers up grape and honey suckle aromas. This is certainly for people who enjoy wines a touch on the sweet side. It is not a dessert wine, but is somewhere between a semi-dry and late harvest riesling. Plenty of attractive fruit flavors. Very nice for a light conversation wine with friends. 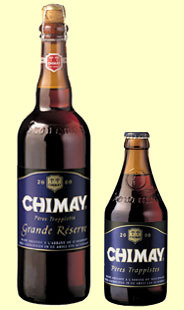 Chimay is one of six Trappist abbey breweries in Belgium. The Abbaye de Notre-Dame de Scourmont not only produces beer, it also makes a range of cheeses. The monks started commercial ventures in 1862 in order to fund projects and provide employment to locals. The brewery was modernized in 1989, but it still only operates between 7 a.m. to 4 p.m. to match with the monk's monestary duties. Chimay Blue is a 9 percent alcohol by volume malty ale. It pours dark brown with a thick lasting off white head. Plenty of sweet chocolately notes to the nose. Good malty backbone, with some fruit and spice notes. Finishes long. You can toast your Dad on Father's Day and support the Us TOO International Prostate Cancer Education and Support Network. Prostate cancer kills nearly 28,000 men in America each year. Few people realize there are roughly as many new prostate cancer cases diagnosed annually in this country as there are new breast cancer cases. For the men battling prostate cancer and their families, the Us TOO International Prostate Cancer Education and Support Network is a place they can turn to for reliable information about the disease and treatment options. 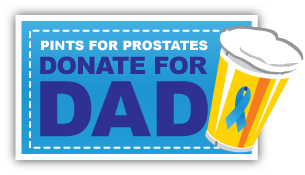 This Father’s Day you can join the Pints for Prostates campaign in raising a glass to Dad and doing something to help men facing prostate cancer. Donate a virtual pint, a six pack, a case or a keg and 100 percent of the net proceeds raised will go directly to the Us TOO International Prostate Cancer Education and Support Network, a great 501(c)3 charity that is celebrating 20 years of helping men fighting prostate cancer and their families. After you make your donation send your Dad an eCard to let him know that you want him to take care of his health by getting an annual prostate health screening and PSA blood test. Whether you say Cheers, Prost, Salud, Amandla, Gan bei, Slainte, L’chaim, Skal, Choc-tee or something else when you are toasting, this year you can honor Dad by helping a great cause. Founders Brewing started in 1997 in a disused factory building that had once been home to the Wolverine Brass Works in Grand Rapids, Michigan. The brewery has expanded and relocated since in order to keep up with demand for its flavorful craft brews. 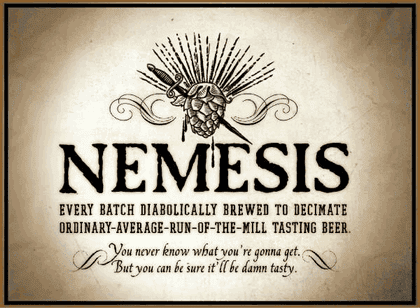 Nemesis is a beer that Founders makes just once a year. It takes different forms each year. The 2009 edition is a wheatwine that is aged with maple in Bourbon barrels. At 12 percent alcohol by volume, the ale has a dark cloudy amber color with a sweet maple nose. Plenty of vanilla and maple in the flavor profile, with solid dark fruits bubbling over. Some tannins from the wood are present and these are likely to smooth over time. Day 144 Drink: Hoppin' Frog Barrel Aged B.O.R.I.S. The brainchild of brewmaster Fred Karm, Hoppin' Frog Brewing is located in Akron, Ohio. The brewery focuses on full flavored beer styles and then comes up with twists to add layers of extra flavor. B.O.R.I.S. stands for Bodacious Oatmeal Russian Imperial Stout. 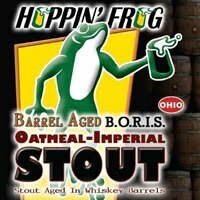 Hoppin' Frog Barrel Aged B.O.R.I.S. is a 9.4 percent alcohol by volume heavyweight. This beer has picked up a ton of flavor from the barrel and put it on top of an already great beer. Nice vanilla, black cherry and raisin notes. Overall a big beer that is well designed. Firestone Walker Brewing has used Parabola as a major blending component in past anniversary brews and they call the barrel aged imperial stout "one of our most aggressive offerings." This is the first time they are bottling Parabola and the beer is actually a blend of several vintages. Parabola is being used to launch the brewery's Proprietors Reserve Series. At a hefty 13 percent alcohol by volume and 80 IBUs this beer is not for those who buy into the new commercials that portray Miller Lite as a "man's beer." 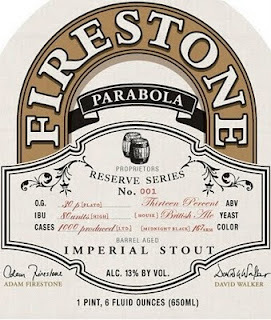 Firestone Walker Parabola is an imperial stout with a nice Bourbon aroma. The beer pours a solid brown-black color with a moderate tan head. There is plenty going on with the flavor. The oak is present, along with some baker's chocolate, dark coffee and even hints of raisins. Plan on sharing the 22 ounce bottle. You will end up making friends. Maker's Mark Distillery is tucked away in the Kentucky countryside near Loretto, about 60 miles south of Louisville. On Friday I was lucky enough to spend a few hours with Bill Samuels Jr., tour the distillery and taste the soon to be released Maker's 46 Bourbon. Samuels is a pretty interesting character. While Maker's Mark is part of Fortune Brands, he clearly runs the distillery as the family business. He almost did not go into making Bourbon. Armed with a law degree from Vanderbilt, he had already accepted a corporate job and needed to be convinced by a friend to go back and put a year in at Maker's Mark. His father, Bill Sr., purchased the distillery in 1953 for $35,000 and his mother, Marge, had designed the iconic bottle using paper mache and used her calligraphy skills to create the Maker's Mark label. The first bottling of Maker's Mark took place in May 1958. According to Samuels, his father set out to create a mash bill to "make a Bourbon for people who didn't like Bourbon." "Traditional Bourbon finishes on your tongue back of the center and along the sides. He wanted Maker's Mark to finish on the tip of your tongue," Samuels says. "You couldn't do it with rye as the flavor, corn had to be the flavor brand. He also tried a number of different wheats to get it right." Maker's Mark started to build a following, but as Samuels puts it "back in the 60s no one cared about Bourbon." The distillery was producing about 45,000 cases a year and then the Wall Street Journal did a front page story about the company in August 1980. That changed everything. "Maker's Mark was Dad's hobby," Samuels said. "It was a hobby until people decided it wasn't a hobby." These days, fans flock to visit the historic distillery and sign up for the Maker's Mark Ambassador program to get their name on a barrel. Samuels says these fans love Maker's Mark, but always ask when the distillery is going to expand its range like other distillers. Over the years the company has tried a few specialty products -- and it does sell a pre-mixed Maker's Mark Mint Julep product for Kentucky Derby fans -- but the original Maker's Mark has pretty much stood alone. Samuels recounts going to master distiller Kevin Smith with a story about having dream that he had seen his tombstone and under his name it said "He didn't f@%# it up." "So I asked Kevin, 'Do you think we could create a product so I could have a better epitaph?'" Samuels says. Working together and keeping the idea away from the sales and marketing staff, the pair went to work on what Samuels calls "the first new product from the distillery in 52 years." Maker's 46 Bourbon gets its name from the unique process that went into creating the finished product. Smith and Samuels worked with "wood chef" Brad Boswell, who experimented with different levels of toast on French white oak staves. Ten of the staves are inserted into barrels with mature Maker's Mark Bourbon and put back into the lower floors of one of the company's rack houses for two to three months. During testing, the barrel Samuels and Smith agreed was the best had satves from Boswell's 46th "recipe." Samuels says they were looking to add wood flavor and spice, without more tannins. Victoria MacRae-Samuels, director of operations, took me and Noah Rothbaum from Liquor.com on a behind the scenes tour of the distillery. The facility runs full out seven days a week and is a hands on operation. MacRae-Samuels also gave us a comparative tasting of Maker's Mark and Maker's 46. Maker's 46 Bourbon is a bright amber color with a warm wood and slightly praline-like nose. The 94 proof spirit displays considerably more wood character than traditional Maker's Mark. Small bits of spice come forward in the finish. You can certainly detect the base Maker's Mark character and that should appeal to core fans. But, this drink leans more in the direction of what most people associate with Bourbon's standard flavor profile, so it should draw new fans to the distillery. They new brand will be released in July. Bamberg, Germany, is a UNESCO World Heritage Site, that is home to nine breweries. Not all of them make smoke beer, in fact just two do it on a regular basis. Few know that the Bamberg Beer Purity Law of 1489 was actually the first to dictate that only hops, malt and water could be used in brewing. (The Reinheitsgobot -- German Beer Purity Law -- was not put in place until 1516.) Prince Bishop Henry III Gross of Trockau had become frustrated by the use of herbs, berries and even mushrooms in the making of beer and decided to take a stand. Spezial Brewery dates back to 1536. Like Schlenkerla, the more famous Bamberg rauchbier brewer, Spezial uses beechwood fueled fires to dry its malted barley. 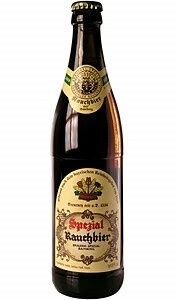 Spezial Rauchbier is an amber brown color and has a soft malty character. Its subtle level of smoke leads you to think of having a second. 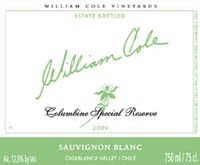 William Cole Vineyards is located in Chile’s Casablanca Valley. The vineyard is located near the coast and the winery specializes in cool climate varieties. William Cole Columbine Special Reserve 2009 Sauvignon Blanc is the kind of $15 a bottle summer sipper that most palates willingly embrace. A floral and slight citrus aroma that opens with with a tropical fruit tartness. As the flavor evolves hints of peaches and green apples emerge. Nothing heavy here. It can certainly match up well with chicken or fish. Pints for Prostates, a campaign reaching men through the universal language of beer, has 14 events scheduled during the next few months across the United States. The grassroots program communicates the importance of regular prostate health screenings and early detection in successfully fighting prostate cancer. Since being launched in late 2008, Pints for Prostates has reached more than 80 million people through a combination of donated advertising, news articles, appearances at beer festivals, and coverage on websites and blogs. In 2009, program was featured at the Livestrong Global Cancer Summit in Dublin, Ireland, and profiled on CNN’s Vital Signs program hosted by Dr. Sanjay Gupta. During the 2010 NHRA season the Yonke Motorsports Pro Stock is racing with the Pints for Prostates logo on the hood of its car. In April, a team of athletes from Columbus, Ohio, ran with prostate cancer survivor Patrick Grubbe in the Boston Marathon wearing uniforms with the Pints for Prostates logo. Pints for Prostates is a registered 501(c)3 charity. The funds it raises support programs that assist men with prostate cancer and research aimed at improving care and finding a cure for the disease. The Us TOO International Prostate Cancer Education and Support Network, founded in 1990 to support, educate and advocate for men with prostate cancer and their families, is a major recipient of support from Pints for Prostates. As part of its fundraising efforts in 2010, Pints for Prostates is accepting $10 donations from beer fans in return for a chance to enter a drawing for a trip for two to the Great American Beer Festival in Denver, Colo., from Sept. 16-19. The trip includes roundtrip airfare for two, three nights at the Sheraton Downtown Hotel, tickets to three nights of the Brewers Association Great American Beer Festival, tickets to the Denver Rare Beer Tasting, a hosted pub crawl and entrance into special beer insider events. In recognition of Father’s Day, supporters can visit www.pintsforprostates.org and “Donate for Dad” by buying a virtual pint ($5), six pack ($10), case ($25) or keg ($100). All net proceed from these donations back the mission of the Us TOO International Prostate Cancer Education and Support Network. May 21, 6-9 p.m.: Us TOO International Prostate Cancer Education and Support Network and the Wellness Place annual Chicagoland Sea Blue Prostate Cancer Walk/Run Team Kickoff. Galway Bar & Grill in Elmhurst, Ill.
May 28-30: Kohler Festival of Beer, Kohler, Wisc., is donating booth space to the Pints for Prostates campaign. June 5, 2-4 p.m. -- Twin Liquors in Bee Cave, Texas, will host a free Rogue Ale tasting to raise awareness about prostate cancer. June 11, 6-9 p.m. -- Akron Alumni Chapter of Kappa Alpha Psi fraternity is holding an awareness event at Edgar’s Restaurant at 530 Nome Avenue in Akron, Ohio. June 12, Noon-10 p.m. -- World Beer Festival in Richmond, Va., is donating booth space to the Pints for Prostates campaign. June 12, Noon-4 p.m. – Charlotte 1K Beer Run at Olde Mecklenburg Brewery, 215 Charlotte, N.C., will benefit the Pints for Prostates campaign. Register at www.1KBeerRun.com. June 16, 6-9 p.m.: Pike Brewing, 1415 1st Ave., Seattle, Wash., will donate a portion of the day’s sales and Pints for Prostates will have a booth at the event. June 16, 8-11:30 p.m.: The Brewing Network and Northern Brewer is hosting a pre-National Homebrewers Conference Party to benefit Pints for Prostates at the Northern Brewer headquarters in Roseville, Minn.
June 19, 1-5 p.m.: Pints for Prostates Los Angeles Beer Fest will be held at Mr. Pockets Sports Bar, 516 N. Sepulveda Blvd., Manhattan Beach, Calif. Tickets are $45 and on sale now at www.pintsforprostates.org. June 19, 6-10 p.m.: Mac’s Speed Shop Barbecue at 2414 Sandy Porter Rd. in Charlotte, N.C., is hosting a Mid-Summer Roman Celebration with cask ale and firkins. June 26, 2-5 p.m.: Dude Fest in the NoDa section of Charlotte, N.C., will feature a Pints for Prostates Beer Garden. Aug. 6-8: Boise BeerFest in Ann Morrison Park in Boise, Idaho, is donating booth space to the Pints for Prostates campaign. Sept. 17, 1-4 p.m.: Denver Rare Beer Tasting II, will feature 24 rare beers from American craft brewers at the Wynkoop Brewery in Denver, Colo. Presented by All About Beer Magazine, tickets are $80 and go on sale June 1 at www.pintsforprostates.org. Oct 2nd: World Beer Festival, Durham Bulls Athletic Park, Durham, N.C. Pints for Prostates will have a booth at the event. Additional events are being booked and information will be listed shortly at www.pintsforprostates.org. Pints for Prostates, is a 501(c)3 campaign that uses the universal language of beer to encourage men to take charge of their health, was founded by prostate cancer survivor Rick Lyke in 2008. The grassroots effort raises awareness among men of the importance of regular health screenings and PSA testing by making appearances at beer festivals, social networking and pro bono advertising. 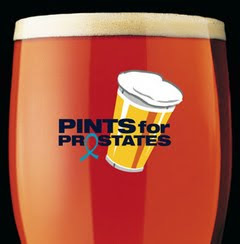 Pints for Prostates supports the Us TOO International Prostate Cancer Education and Support Network, a 501(c)3 charity that works to support, educate and advocate for men with prostate cancer and their families. More information is available at www.pintsforprostates.org. Pints for Prostates also has a presence on Facebook and Twitter (@pints4prostates). Sun Garden Riesling comes from Bernkastel-Kues, Germany, in the Mosel region. The winery focuses on Riesling and Pinot Noir. Sun Garden buys grapes from a local cooperative, whose members operate vineyards on slopes overlooking the river valley. The slate in the soil gives local wines a touch of minerality. Sun Garden 2007 Riesling pours a light straw color and has a inviting floral aroma. The overall flavor is semi-dry with hints of pear and melon. Not overly complex, but a good summer cocktail hour wine. Michelob Brewing is releasing new summer sampler 12- and 24-packs that contains four different wheat brews: Shock Top Belgian White, Michelob Dunkel Weisse, Hop Hound Amber Wheat and a new brew, Michelob Ginger Wheat. Michelob Brewing is located in a research brewery next to the Anheuser-Busch InBev plant in St. Louis. The brewery may have up to 50 different beers in the tanks at any one time. Some never make it past the exploration stage. Others, like Michelob Ginger Wheat, make it into sampler packs or full distribution. Michelob Ginger Wheat is a 5.2 percent alcohol by volume unfiltered Belgian-style wheat ale made with citrus peels, spices and accented with ginger notes. The beer pours a cloudy orange gold color with a decent head. The brew has a sharp citrus and ginger edge. Gekkeikan Sake Co., based in Kyoto, Japan, was founded in 1637 by the Okura family. With nearly 400 years and 14 generations of sake brewing experience, Gekkeikan, one of the oldest-family operated businesses in the world. It has been the official sake of Japan’s Imperial Household for almost a century. Zipang Sparkling Sake is perfectly clear with a bright effervescence. The aroma is slightly sweet, with a touch of floral. The flavor is sort of a cross between a dry sparkling wine and a cider. The maker recommends drinking it neat or in a cocktail. The rumors are true. The Denver Rare Beer Tasting will be back this year during the Great American Beer Festival when thousands of beer fans are in the Mile High City. The event sold out last year six weeks in advance and was one of the highlights of the beer festivities taking place in Denver. Brewers from across the U.S. brought 24 rare, exotic and hard to find brews to the inaugural event. The event is presented by All About Beer Magazine and will be held on Sept. 17 from 1-4 p.m. at the Wynkoop Brewery on 18th Street in Denver. 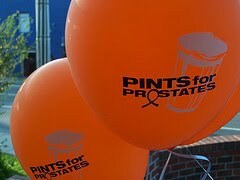 The event raises funds for Pints for Prostates, a campaign that uses the universal language of beer to reach men with an important health message. This video was shot at last year's Denver Rare Beer Tasting. Organizers of the event are contacting brewers now to gather unique brews for the event and the line up will be announced during August. Tickets for Denver Rare Beer Tasting II are $80 and will go on sale June 1. Visit www.pintsforprostates.org and click on the link to order tickets. Samuel Smith’s organic fruit beers are brewed and fermented at the Melbourn Bros. Brewery, located in Stamford, Lincolnshire then transferred and aged at Samuel Smith’s Brewery in Tadcaster, England. The company makes strawbeery, cherry and raspberry fruit ales. Samuel Smith Organic Strawberry Ale has a fresh strawberry nose that emerges as soon as you open the bottle. It pours an amber gold color with a moderate head. The strawberry flavor note is clear. The beer is balanced and not overly sweet. Tom Jordan founded Jordan Vineyard & Winery in 1972 in Sonoma County, California. His son, John, left his law practice five years ago to lead the family business. 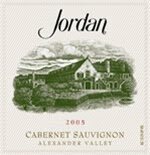 Jordan 2006 Cabernet Sauvignon is a purple red Alexander Valley wine with a silky smooth and full flavor profile. The wine is a blend of 75 percent Cabernet Sauvignon, 19 percent Merlot, 5 percent Petit Verdot and 1 percent Malbec. Blackberry and cassis come together well upfront in this 13.5 percent alcohol by volume wine, which has a round finish. Just a hint of spice and wood in the finish. A very nice dinner wine. 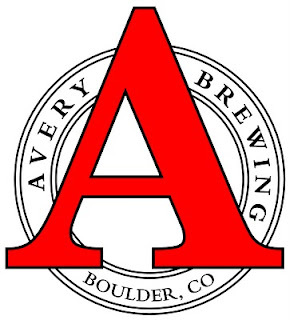 Avery Brewing was founded in 1993 in Boulder, Colo. The brewery has a reputation for producing some of America's most flavorful beers and you can trace these roots back to the 1994 Great American Beer Festival when a relatively unknown beer from a relatively unknown brewery took home a gold medal. 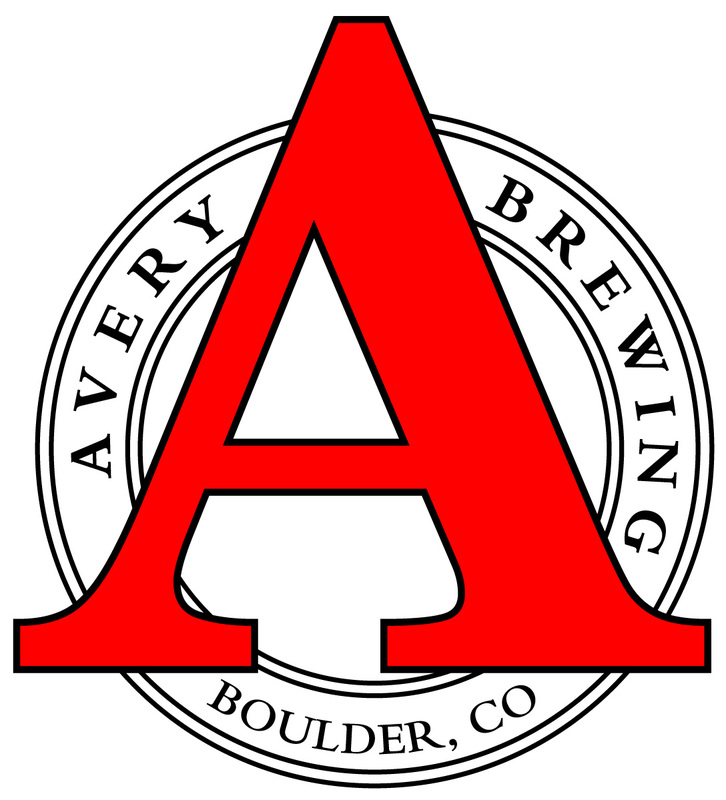 Avery Out of Bounds Stout helped put the brewery on the map by impressing the GABF judges 16 years ago. It is still a pretty impressive brew. Avery Out of Bounds Stout pours a jet black color with a thick tan head. The 5.1 percent alcohol by volume beer has a roasted grain aroma and the initial flavor has plenty of hops. The Bullion and Fuggles hops in the ale produce a 51 IBU reading. I enjoyed this full bodied beer on a very hot May afternoon in Charlotte, but it had a nice refreshing edge that cut through the heat. Highly enjoyable for any fan of stouts. Southampton Publick House produces a range of traditional British, German, American and Belgian brews. Founded in 1996, Southampton brews at least 26 different styles of beer each year. Brewmaster Phil Markowski started his career at New England Brewing Company in Connecticut. He has earned 22 medals at the Great American Beer Festival. He also was awarded the Institute For Brewing Studies Russell Scherer Award For Innovation In Craft Brewing in 2003 and regularly writes about brewing. Southampton Keller Pils is brewed with a single hop variety, Pilsner. The beer pours a slightly hazy golden color with a firm head. Keller beer is unfiltered and comes directly from the aging tanks. The 35 IBUs give this 5 percent alcohol by volume beer a nice crisp edge. The German malts round out the brew and impart a mellow sweetness. This is a wonderful brew for a hot day under a shade tree. Brasserie Dupont is a Belgian family run brewery that is located on a farm that can trace its brewing roots back to 1759. Since 1990, the company has also operated a bakery and makes cheese. 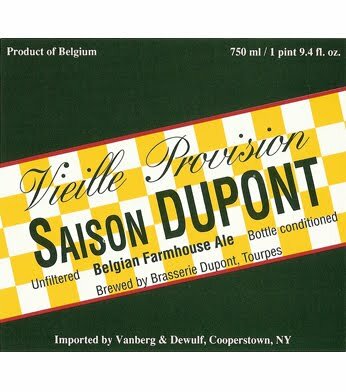 Originally, Saison Dupont was a 4.5 percent alcohol by volume beer, often used as a refresher in the summer by laborers. Since the 1950s the beer has been at its current 6.5 percent alcohol by volume strength. 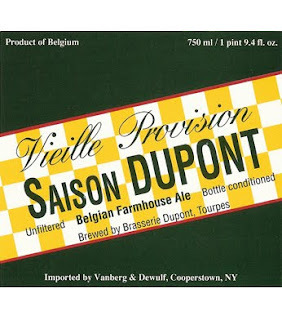 Saison Dupont pours a hazy yellow with a thin, but persistent white head. The aroma of the ale has a slight citrus note and a touch of wild yeast. The flavor is a combination of bright spicy highlights, with a clean dry finish. Can the Drink in Your Hand Predict the World Cup Champion? The FIFA World Cup kicks off in South Africa a month from today when the host country takes on Mexico in Johannesburg. When this tournament is played every four years productivity takes a major hit as workers have sudden unexplained illnesses on the days when matches involving their countries are played. Wagering on fixtures is big business based on the number of casinos posting odds on the teams – the odds listed below are from United Kingdom’s bet365 Group Limited. And the tournament provides a big boost to the drinks industry, not only in the host country where thirsty fans from around the world put a strain on the distribution system, but also back home where supporters either celebrate victories or drown their sorrows after each match. 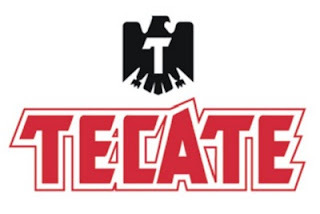 As the teams make final roster adjustments and fans look hard at group stage opponents to see how likely it will be for their teams make it to the round of 16, Lyke2Drink has decided to play a fantasy World Cup not based on soccer playing prowess, but instead by examining the skill and creativity the country brings to the drinks world. Might it be that a country’s drinking heritage is a sound predictor of its performance on the 2010 World Cup stage? Take a look at the results of the Lyke2Drink World Cup and follow along during the action in South Africa. The bookies might want to take notice and adjust the odds. 1. France (18:1) France wins the group based on the strength of its many wine regions. 2. Mexico (80:1) Tequila can do many things, including helping Mexico advance. 3. South Africa (125:1) Before South African Breweries became SABMiller and moved their headquarters to London the hosts may have pulled off an upset. 4. Uruguay (100:1) The per capita alcohol consumption in Uruguay would have put them through in some other groups. Not this one. 1. Argentina (7:1) The mighty Malbec grape helps Argentina win the group. 2. Greece (150:1) Ouzo served liberally gets Greece to the knock out round. 3. South Korea (250:1) Riding high on traditional Soju, Yakju, Cheongju, Takju, along with fruit, flower and herbal wines, watch out for upset minded South Korea. 4. Nigeria (150:1) A large Muslim population in Nigeria means that a significant segment of the country refrains from alcohol. Beer is by far the most popular alcohol beverage and sales are growing, so look out in 2014. 1. USA (80:1) Combine the strength of the craft beer movement, popularity of California wines on the world stage and the demand for Bourbon and you have a group stage upset. 2. England (6:1) Fans might be bitter (while drinking a pint of Bitter) about not winning the group, but England survives to fight another day. 3. Slovenia (200:1 )Fans will need a shot or two of Brinjevec to get over their disappointment. 4. Algeria (350:1) The sale of alcohol is restricted and taxes on booze are very high in the country. Many shops selling beer and wine were forced to close recently. 1. Germany (12:1) Germany wins this group based on Bavaria’s Beer output alone. 2. Australia (125:1) The Aussies pull an upset in the group thanks to the one two punch of good affordable Wine and crisp Lagers. 3. Ghana (66:1) Palm Wine, Pito (millet wine) and Akpeteshie (a local 80 proof spirit) make a good case, but Ghana falls short. 4. Serbia (66:1) Rakia and Slivovitz are not powerful enough to move the Serbs forward. 1. Netherlands (12:1) Dutch courage is on full display. Genever helps Holland sweep the group. 2. Japan (250:1) People did not see this coming, but Sake and Japanese Beer pulled off the major upset. 3. Cameroon (100:1) A few years back promotional beer bottle caps were turned into make shift currency by locals. Cameroon just fails to make it out of the group. 4. Denmark (150:1) Carlsberg and Schnapps notwithstanding, Denmark makes an early departure. 1. Italy (12:1) Italy does not even have to break out the Grappa to win this group. 2. Slovakia (200:1) Decent Pilsner-style beers, a strong local Wine industry and Slivovica and Borovicka brandies carry Slovakia to the next round. 3. New Zealand (2000:1) Sauvignon Blanc and Lager is just not enough to move forward. 4. Paraguay (80:1) Among drinkers in this group, Paraguay is dead last by a good margin in per capita consumption. They just did not come ready to play. 1. Brazil (5:1) Cachaca has the Brazilians doing the samba into the next round. 2. Portugal (28:1) Portugal is ranked at the top of alcohol consuming countries in Europe. They have earned a place in the next round. 3. Ivory Coast (28:1) Beer is more popular than water in most of the country, but this is a very tough group. 4. North Korea (1500:1) The government allowed its first ever advertisements for Beer just last year. And North Korean diplomats have been tossed out of a couple of countries from smuggling alcohol into those nations. 1. Spain (4:1) Sherry and Cava help Spain win this group in style. 2. Chile (66:1) They have been making Wine in Chile for five centuries and they are a force on the world market. No need to break out the Pisco to move to the next round. 3. Switzerland (150:1) Domestic Beer, Wine and Eau de Vie just is not enough in this group. 4. Honduras (1000:1) Some decent Lager Beers for hot days, but no way competitive in this group. France vs. Greece: The French use Cognac and Calvados to match up against Ouzo and Greek beer. Champagne scores the winner. USA vs. Australia: The Aussies come out strong, but they cannot keep up with the Americans who throw Moonshine in as a second half sub on the way to the win. Netherlands vs. Slovakia: The Dutch come out of the gate strong with a winning line up of Beers the Slovaks cannot match. Brazil vs. Chile: A very tightly contested match. Chile scores early with great Wines at value prices, but the Brazilians come back with major Beer brands and rounds of Caipirinhas. 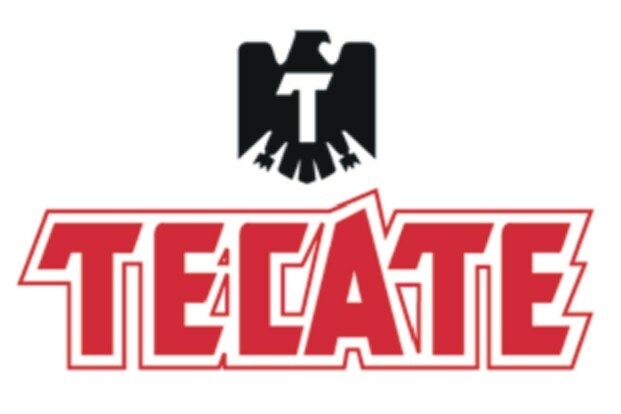 Argentina vs. Mexico: An interesting match, but just when Argentina thinks it has an answer for Tequila, the Mexicans (coached by the Most Interesting Man in the World) start doing shots of single village Mezcal. Germany vs. England: One of the best matches of the tournament. Lager vs. Ale. Gin vs. Schnapps. This one is close until Riesling is awarded a penalty kick in extra time. The Germans move on. Italy vs. Japan: Never in doubt as Italy gets to rest some of its stars and Lemoncello even gets in on the scoring. Spain vs. Portugal: The battle of the Iberian Peninsula. Spain’s Wine production and quality are just too much for Portugal, even with a strong performance from Port. France vs. USA: Just like the Judgment at Paris turned the French wine world on its ear, French supporters find the U.S. drinks team is too much to handle. Bourbon, Tennessee, Rye, Wheat and Corn Whiskies are just too much. Netherlands vs. Brazil: In an upset, the Dutch show they originated Gin and cause the Brazilians to go on defense for much of the match trying to prove Cachaca is not just an off shoot of rum. Mexico vs. Germany: In a low scoring match, the Germans push home the winning goal by showing unexpected beer diversity at mid-field with Rauchbier, Gose, Kolsch and Hefeweizen. Italy vs. Spain: A very tough quarter final that finds Prosecco and Cava getting early scores. Chianti proves to be the difference in this match. USA vs. Netherlands: The U.S. unleashes Wines from the west coast, with Napa, Sonoma, Oregon and Washington giving the Netherlands early troubles. In the end, oak aged Beers from microbrewers produce a surprise shutout of the Dutch. Germany vs. Italy: The Italians lead with their strength: Wine. The Germans answer with Beer. The match is decided in added time by a header. Since German Lagers have heads and Italian Barolos do not, the Germans reach the finals. Netherlands vs. Italy: Italy gets some help from Grappa in slowing the Dutch down. DOCG wines are just too much to handle and Italy takes third place. USA vs. Germany: In this match between titanic drinks nations you have to look at history to find separation. The Germans have lived by the Reinheitsgebot beer purity law for centuries. They far out consume the U.S. on a per capita basis. America actually had prohibition from 1920-1933. The Germans win the Lyke2Drink World Cup. Casanova di Neri was established in 1971 in the heart of Tuscany. The vineyards south of Siena include 138 acres that produce great Brunello wines. Tenuta Nuova 2004 Brunello di Montalcino DOCG is made with 100 percent Sangiovese grapes and, after 23 days of maceration and fermentation, aged in French oak for 29 months. The wine offers full, dry ripe berries, with hints of wood. The wine has smooth tannins and a long finish. A big Italian red. This is a big week in Charlotte, N.C. On Tuesday the NASCAR Hall of Fame officially opens its door. From Thursday to Sunday an event called "UltraSwim" featuring Olympic swimmer Michael Phelps takes over the Mecklenburg Aquatic Center. On Friday to Sunday, the National Riffle Association annual convention comes to town with featured speakers Sarah Palin and Glenn Beck. Even though the last three North Carolina governors have been Democrats, I just may live in a Red State. No matter your political leanings, if you enjoy adult beverages and cars that go fast a trip to the NASCAR Hall of Fame is worth the $19.95 price of admission. I got the chance to get a sneak peak at the facility a few days back thanks to Jake Koneman, who is engaged to marry my daughter, Brhea. Jake has a history degree from the University of Wisconsin-Milwaukee and did an internship cataloging artifacts donated to the Hall of Fame. He spent hours sorting through everything from engine parts to NASCAR Winston Cups. For all of his hard work he was given a pair of tickets to see a preview of the facility. The 150,000-square-foot NASCAR Hall of Fame honors the history and heritage of NASCAR. A big part of that history is intermingled with alcohol. Part of the legend of the early days of NASCAR is that moonshine runners started get together to race their cars for bragging rights. As the racing became more popular, safety and competition rules were needed and NASCAR was born. The best known moonshiner turned racer is Junior Johnson. He made his first moonshine run at the age of 14 and was convicted in 1956 on a charge of producing illegal liquor. He served 11 months in federal prison and years later was pardoned by President Ronald Reagan. Johnson launched a commercially produced "legal" moonshine a couple of years back. Johnson won the second Daytona 500 in 1960 and was credited for the discovery of drafting on super speedways. He won 50 races at NASCAR's top level before becoming a car owner. His drivers won 132 races and six championships. 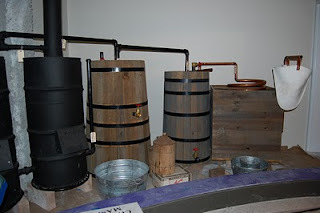 Johnson donated something to the NASCAR Hall of Fame you won't see in Cooperstown or Canton: a working moonshine still. 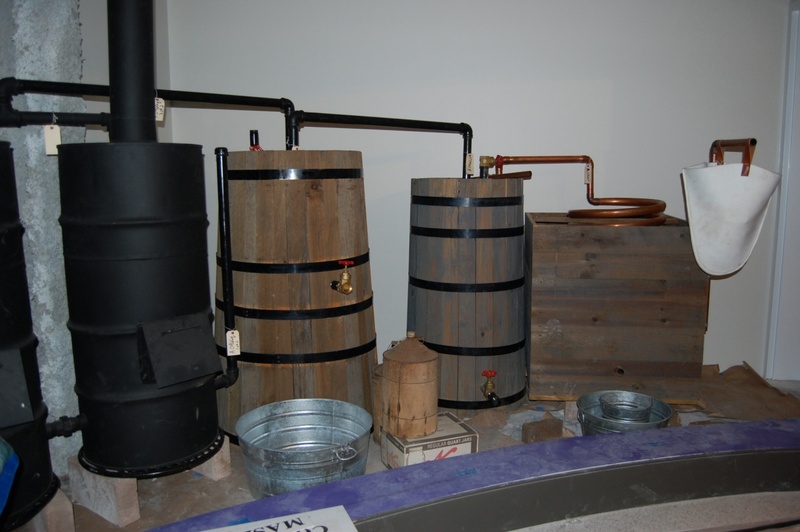 Johnson actually had to assist museum staff correctly install the still, which can be found on the fourth floor of the museum. I guess the basics of building a still are something you don't forget. Johnson's still is not the only drinks related piece of memorabilia in the Hall of Fame. Cars carrying the sponsorship of Coors, Busch, Miller and Miller Lite are featured. Other memorability, trophies, video and photos show how drinks companies have marketed to race fans. One of the more interesting exhibits concerns the 1979 Daytona 500 and its role in propelling the sport to popularity outside of the southeastern United States. A snow storm hit much of the northeast and it was the first 500 mile NASCAR race to be broadcast nationally in its entirety, creating a large television audience. As CBS viewers watched, Cale Yarborough, driving the Busch beer sponsored car, made a final lap move to pass Donnie Allison on the back stretch. Allison blocked him and the pair crashed. Richard Petty ended up winning the race, but before cameras showed the victory lane celebration viewers got an eye full of Allison, his brother Bobby Allison and Yarborough trading punches. A legion of fans were created almost instantly. No one is expected to duke it out at the Hall of Fame opening on Tuesday. Dale Earnhardt, Bill France Jr., Bill France Sr., Junior Johnson and Richard Petty will be inducted into the Hall of Fame as the inaugural class during ceremonies on May 23rd. Moscato d'Asti can be no more than 5.5 percent alcohol by volume by law. This leaves ample sugar behind that gives the slightly sparkling wines their signature sweetness. 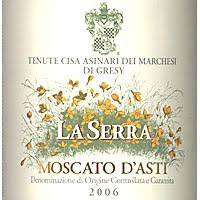 La Serra 2009 Moscato d'Asti DOCG is from Cassine in Alessandria province. The wine has a crispness with hints of pear, peaches and pineapple. Lovely wine for after a great meal. Magic Hat Brewing is located in South Burlington, Vt. The brewery has been around since 1994.The brewery has some of the more colorful brand names, including #9, Circus Boy and Lucky Kat are just a few. 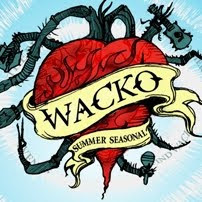 Magic Hat Wacko Summer Seasonal uses a single malt, pale; a single hop, Apollo; and one of the more interesting ingredients seen recently, beet sugar. The 4.5 percent alcohol by volume beer has a interesting pink color with a moderate head. The beer is smooth, with just 15 IBUs, slightly malty with a dry finish. Mike Bee and Jim Peterson are law in Charleston, West Virgina, with a dream of making wines in the Napa Valley. In 1995, they produce their first vintage of Falcor Chardonnay. Of the 192 cases made, the duo sold five, gave five away and drank the rest. Things have gone a little better since then. Falcor 2003 Le Bijou Napa Valley is a blend of 41 percent cabernet franc, 38 percent cabernet sauvignon, 17 percent merlot ands 4 percent petit verdot. The wine is a dark purple color and opens with plenty a rich dark berries. The wine has a good level of tannins that smooth out the wine. Nice rich wine with hints of wood in the finish. Very good with a porterhouse. Bacardi has been around since 1862 when founder Don Facundo Bacardi began producing a light-bodied, smooth rum in Cuba. Today, Bacardi rum is produced in Puerto Rico, using a five step distillation process, aged in American white oak barrels, and filtered five times. The distillery sits on a beautiful piece of land on the coast outside of San Juan. The latest flavored rum from Bacardi is Torched Cherry. The 70 proof rum combines Barbados cherries with an infusion of the Torch Plant aloe. The result is a spirit that has a sweet cherry soda nose, with perhaps just a hint of cherry cough syrup. The flavor is a cobination of sweet notes to start, with a tart finish. Bacardi recommends making a Cherry Rum and Coke with this spirit and that will work quite nicely as a summer cocktail.